We celebrated Earth Day a little late this year, as it fell mid-week. (And really, every day is Earth Day here.) 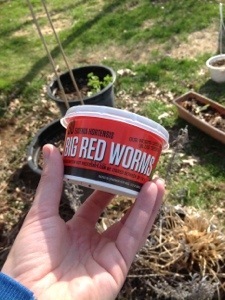 This past Sunday we decided to add some Red Wiggler Worms, Eisenia hortensia, aka European Red Wigglers to our compost pile. The benefits of composting our food scraps and using them as soil for the edible garden are well known. 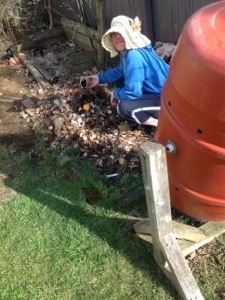 Composting with worms is considered a more varsity level sport in the gardening world, but it can be very simple. 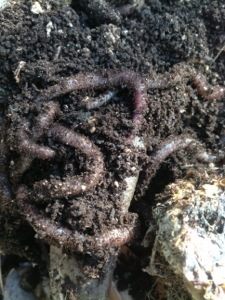 The best worms to use are our native red worms, Eisenia fetida. The native red worms co-evolved with our ecosystem so they can withstand our upstate New York winters compared to the European wigglers, who die when the weather turns cold. Any way you want to look at it though, these worms got a better deal than they expected. They were for sale at the fishing bait store, poised to get a sharp hook jabbed through their soft bodies until a trout or sunfish ate them. 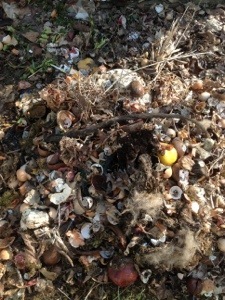 Instead, we released them into a huge pile of herbacious organic food waste: their favorite place to be on Earth. These worms have voracious appetites, they are workhorses. I expect they will level this compost pile into delightfully useful worm castings (aka, “brown gold”) within several weeks. And my vegan friends will rejoice at the worm’s happy end in this story. Last year, at a rain gardening conference I heard Paul Tukey challenge the audience to mention an activity that gives back to the Earth more directly than composting. We take and take and take from the Earth’s top layer through big agriculture, erosion, building roads and other construction. We have lost so much top soil in the past 50 years; keeping a compost pile actually regenerates a precious resource. Many people who compost with worms make it an elaborate process, but it can be as simple as adding worms to your current compost pile like we did here. 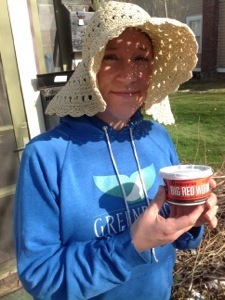 Composting with worms and choosing native plant species in the garden are two solid ways we can return the Earth’s generosity, whether it happens to be April 22cnd, Earth Day, or any other date on earth.